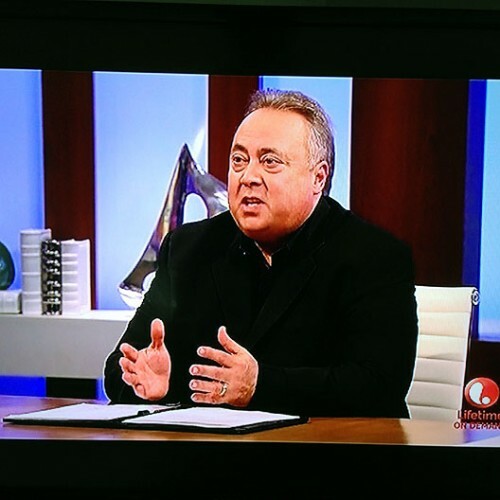 I was contacted by the owner of this sauce who was extremely enthusiastic about his sauce that had recently been featured on the show Supermarket Superstar on the Lifetime Network. Cool. Just so you know, I try as best I can to go into judging blind. I try to not read any other reviews or visit the companies websites before a review. 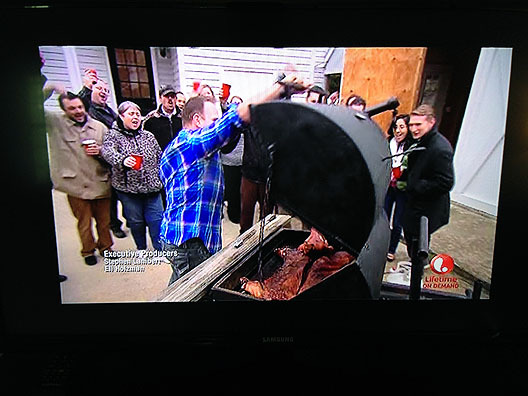 So before I watched the show, I reviewed the sauce as to not be swayed by the outcome of their judging. Luckily we haven’t cancelled cable yet so I went into our Comcast On Demand and found the Supermarket Star. Why hadn’t I seen this show earlier?! It is pretty good. It’s like Shark Tank focused on food products. The judges are a lot like the original American Idol judge’s with the sappy successful lady Mrs Field (like Paula), the friendly bug guy (like Randy), and the in your face blunt feedback give-it-to-you-straight guy (like Simon). 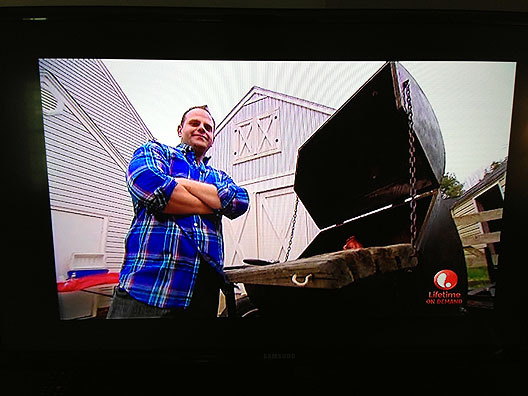 The blunt feedback guy on this show is great – I thought that all of his comments regarding taste and flavor and logos and marketing were right on the money. The outside of the bottle is good – it’s like a bacon guy and a hot habanero going to a movie premiere. Nice concept. It looks like it’s a famous sauce – and after the 15 minutes on Lifetime, it could certainly be ever more famous with married housewives. The only criticism is that it’s a bit busy and there’s some much going on that it is tough to focus on one particular section. I would lose everything here and focus on BACON. Plain white label, strip of bacon. Or Call it BACON MELTDOWN and have it in yellow and make it look like a play on the symbol for nuclear waste / hazardous material showing that there is so much bacon it’s dangerous. He emphasizes that he puts the maximum amount of bacon allowable by law so there is a story to be wrapped around that Max Bacon idea. The inside of the bottle is a a very simple, sweet, ketchup-like BBQ sauce with a subtle habanero flavor (but no heat) and a good amount of bacon chunks. The flavor uncooked was just a little mild and although I tasted the habanero, I didn’t feel any heat from it, although the label’s hot indicator told me to expect a medium level of heat. I always tend to think a medium level of heat is something like a few drops of tabasco sauce or Frank’s Red Hot – hot enough to spice it up when used sparingly, but not hot enough to really feel the burn and ruin your meal. I also think Old El Paso Salsa is a good standard for what I think of as heat levels (Mild, Medium, Hot). I think there is an opportunity to add a bit more heat there to match the expectation set by the label. I would also lose the habanero except for a kicked up hotter version. The key story and ingredient is placed last on the label. 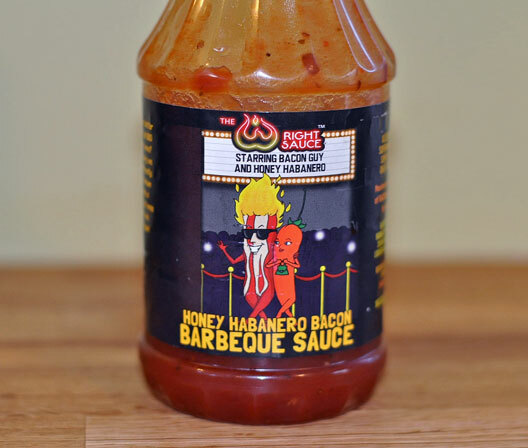 Instead of Honey Habanero Bacon, lose the honey and habanero and call it Bacon Meltdown. 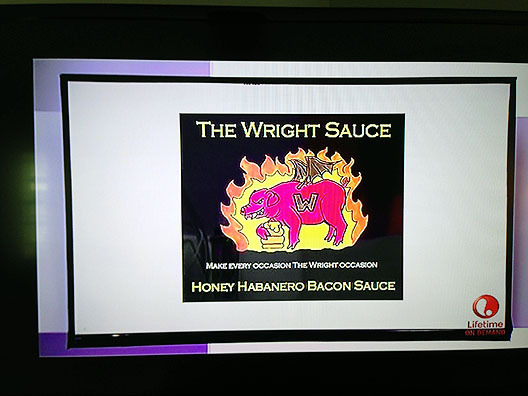 Or something like The Wright Sauce Extreme Bacon Edition. 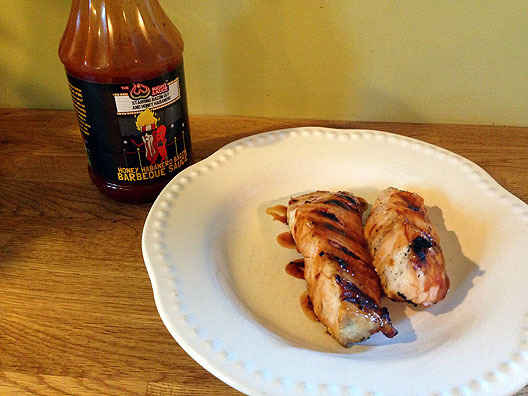 The market has a few bacon sauces out there, so try to make yours stand out. As it cooked, the sauce thinned out a bit but retained a very simple but pleasurable flavor. It’s a nice mild sauce for nearly anyone to enjoy and the fact that there’s bacon in it, would be reason to get people talking about it. It’s an interesting sauce, with a great story, and has had exposure on a great show, but could use some additional work in the heat, flavor, and label areas to really bring this product to life. OH – so what happened to Adam on the show? In the show, Adam made it into round 2 past “Torchy’s Flaming Ember Sauce” but failed to impress the final judge (a buyer from the grocery store A&P) more than the woman with the Jammin Jerk Seasoning concept. 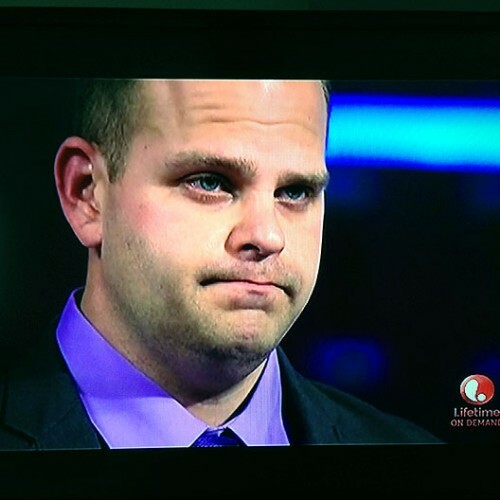 Adam seemed like a super nice guy on the show and I wish him the best of luck. If you like this story, please support Adam on Kickstarter here!